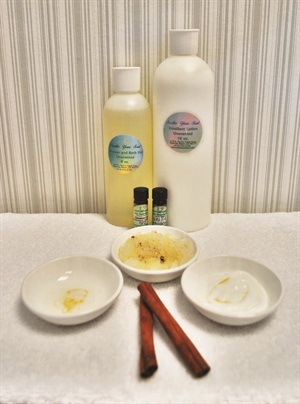 Soothe Your Soul Unscented Shower and Bath Gel, Cinnamon Leaf Essential Oil, Vanilla Whisper Essential Oil, Emollient Lotion; CND Stickey; polish; INM Out the Door Top Coat; ground cinnamon, grapeseed oil, sugar, acetone. 1. Soak the client’s feet in warm water with Soothe Your Soul’s Unscented Shower and Bath Gel blended with a few drops each of Soothe Your Soul’s Cinnamon Leaf and Soothe Your Soul’s Vanilla Whisper Essential Oil. Add a pinch of ground cinnamon. 2. Prep the client’s nails. Use a foot file to lessen the client’s calluses, if necessary. 3. Slowly mix grapeseed oil into sugar, then add a few drops each of Cinnamon Leaf and Vanilla Whisper essential oil. Apply this scrub to the client’s feet and lower legs. 5. Wrap the client’s lower legs and feet with hot towels, then remove the sugar scrub with the hot towel. Place the client’s feet back into the warm water and rinse off any excess scrub. 6. Remove one foot at a time from the bath. Dry the client’s feet off and apply cuticle oil. Massage the client’s feet with Soothe Your Soul’s Emollient Lotion blended with a few drops each of Cinnamon Leaf and Vanilla Whisper essential oil. 7. Use acetone to clean the nails. Apply CND’s Stickey base coat, two coats of polish, and finish with INM’s Out The Door top coat. Want to see your salon's Signature Service here? E-mail [email protected].